Exploring a portion of the Menuha Formation (Upper Cretaceous) in Wadi Aqrav (“Scorpion Wash” which we may rename “Tick Wash”). Coordinates: N30° 33.712′, E34° 38.844′. Our source of shade in Wadi Aqrav is unusually good (until the afternoon sun finds the inside). 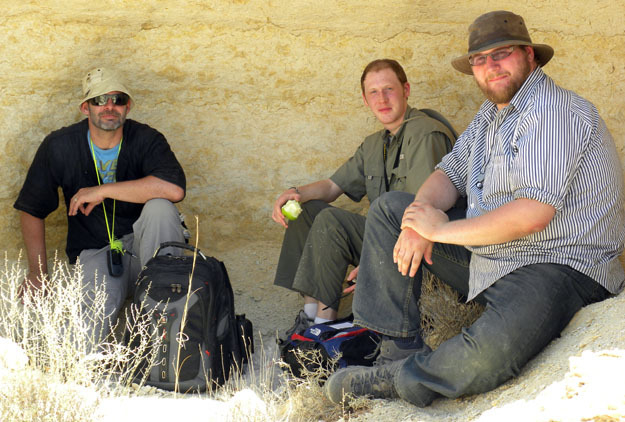 Our team in the Wadi Aqrav cave, left to right: Stuart Chubb (Birkbeck College, London), Andrew Retzler (Wooster senior) and Micah Risacher (Wooster senior). Excellent fossil echinoids we found today in the Menuha Formation. The one on the left is a regular echinoid (the sea urchin type); the one on the right is an irregular echinoid (the sea biscuit type).